Learn practical ways to add speed and convenience to OmniFocus on Mac and iOS. OmniFocus for iOS automation abilities have take a big step forward since this session was recorded. To learn more, watch the recording of the October 12, 2016 session, Automating OmniFocus on iOS. By introducing convenient shortcuts and automations for OmniFocus activities that you perform on a regular basis you’ll be able to access and create actions and projects faster than ever before. The cumulative time savings that is available by applying these techniques can be quite significant. Additionally, having more efficient ways to access OmniFocus reduces friction and encourages regular use. Installing and using AppleScripts with OmniFocus for Mac (Pro Edition). Visit the OmniFocus AppleScript Directory for links to all of the AppleScripts referenced in this session. Conveniently launching OmniFocus AppleScripts using FastScripts. Creating an OmniFocus project based on a predefined template, complete with prompts for project-specific information and dates. Using Keyboard Maestro to quickly and conveniently access information stored in OmniFocus for Mac. For example, by pressing a hot key, you can launch OmniFocus (if it's not already running) and be searching a list of all remaining tasks within seconds. Automatically creating OmniFocus actions using Hazel for Mac, building on the material presented in the Taming Email with OmniFocus session. See the Create OmniFocus Tasks with AppleScript blog post by David Sparks for additional information. Using IFTTT (“If This Then That") recipes to automatically create OmniFocus actions based on a wide variety of triggers, including tags in Pocket and files added to Dropbox folders. Using TaskClone to automatically create OmniFocus actions from Evernote checkboxes. Accessing perspectives and quickly creating new actions using Launch Center Pro for iOS. Creating OmniFocus tasks in a multitude of ways using Drafts for iOS. Click the “Download Macros” button to download a zip file containing the Keyboard Maestro macros that were featured in this session. Please Note: Most macros reference built-in perspectives and features and will work without any additional modification, but a few (Jump to Important, Search Available and Search Remaining) rely on custom perspectives. 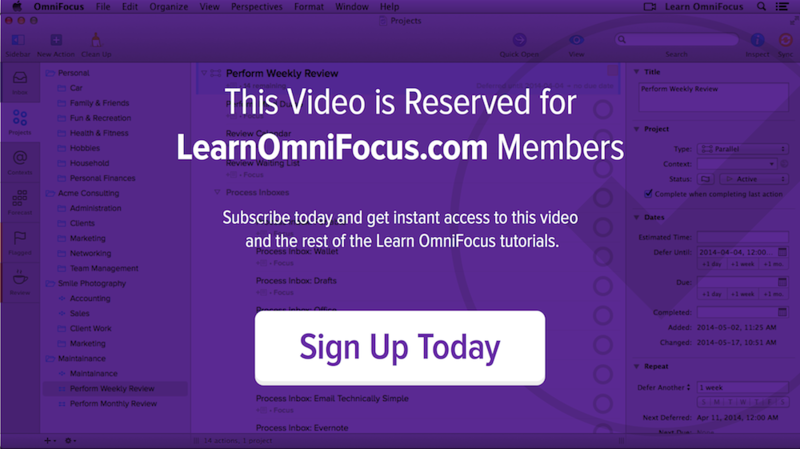 For more information on creating custom perspectives watch the Custom Perspectives with OmniFocus for Mac (Pro) video. It will also be necessary to remap the hotkeys contained within these macros if they conflict with other hotkeys you’re using. These macros are provided without warranty and are not guaranteed to work in current or future versions of OmniFocus.